We have a rolling programme of updates to our studios, to ensure that they are up-to-date and representative of the industry that our graduates go into. A few years ago, we updated studio 3, changing the configuration, replacing the acoustic treatment, and putting in a new mixing console. The final result has been great for us, the Neve 88D console has Encore automation that is identical to that on Neve analogue consoles that you find in the best recording studios such as Air and Abbey Road, and the processing and signal flow configuration is identical to the Neve digital film consoles that you find in the best post-production studios such as Goldcrest and Twickenham Studios. This summer, it’s the turn of studio 1. We upgraded the acoustics of the control room a few years ago, so the main work here was to replace the console and add new functionality. Studio 1 is our 'classical' recording studio. The studio floor is designed to be acoustically similar to a chamber concert hall, with a reverb time of around 1.1 to 1.5 seconds. The area of the studio floor is around 250 square metres, so it's possible to record anything from a solo singer to a large orchestra and choir. Also included are a Steinway D concert grand piano, a harpsichord, and a range of percussion equipment. Students have recorded a great range of music in there, from classical to pop and everything in-between. You can see a few example videos below. At the start of the summer, the control room looked something like this. The room was centred around the Sony DMX-R100 console, which was (and still is) a great digital console which offered very good functionality for its price. It is relatively simple and user-friendly for students new to recording, but has the flexibility and sound quality to make a very good recording. However, ours is getting a bit old, it's not supported any more, and modern consoles offer much more flexibility and processing power which will allow students to undertake more complex recording and mixing projects. Hence, it's time to upgrade. 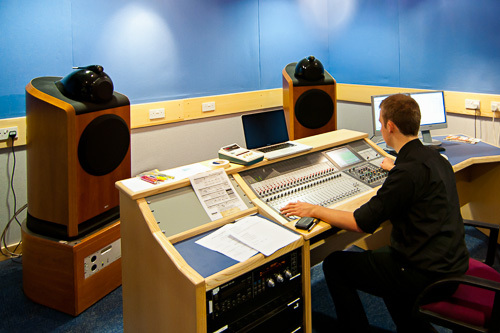 The majority of the time the studio is used by Tonmeister students to capture music recordings. This means that the equipment needs to allow tracking to a multitrack recorder (we have Pyramix installed in this studio as it's more widely used in classical music) through a high quality signal path. This audio can be edited and mixed in one of our edit rooms or studios, but is often mixed in studio 1. Therefore the equipment needs to allow mixing (with automation), and ideally with instant recall so that students can make a mix, take it elsewhere to listen, and then come back later to make adjustments (you know, it never sounds the same in the cold light of the next morning, does it?). Every Wednesday lunchtime during term time the studio is used for a lunchtime concert. These concerts are given by either visiting performers or our own students studying performance on any of the Music degree programmes. They are all recorded by Tonmeisters, as they are a great exercise in getting the best out of a challenging situation. Recording a concert rather than a recording session introduces compromises about the positioning of the musicians and the microphones. On top of this, there may be many ensembles in a single concert (which can range from a single flute to an orchestra via a big band and a choir in a single concert), requiring more compromises of equipment and positioning. On top of this, the students need to make a live mix to stereo, which can be challenging with even a relatively simple setup. To enable this, the equipment needs to allow simultaneous mixing to stereo with a multitrack backup, as well as instantaneous recall of setting snapshots from the technical rehearsal to make it practical to switch quickly between different settings for each ensemble. Finally, with the development of our new programme in Film and Video Production Technology, we have the possibility of being able to do bigger audio/video productions. Ideally in the future we'd like to be able to broadcast the concerts live on the internet, as well as recording both audio and video of the concerts for archive purposes. This means that the equipment in Studio 1 needs to be able to interface with the TV Studio including integrated audio and communications. All in all, it's a big challenge to come up with an installation that can do all of these things, in a way that's representative of professional studios, keeps us abreast of current industry practice, and is something that has educational benefits for all years of the Tonmeister degree programme. Here's the next instalment of the story - what console did we buy?.